In the architectural education and even more in architectural practices, a well-developed rendering of the structure is the most significant mode of communication. A powerful rendering is exactly the kind of visceral imagery that the firms drew upon on their ways to transform their concepts into multidimensional realities. The building projects that include commercial towers and residences to shopping malls, art museums and music halls to skyscrapers, often constitute a literal translation of their concept renderings. In some cases, other projects depicts the formal language of the renderings but, due to either material selection, financial constraints or redesign may have lost some of the awe-inducing, breathtaking and mystical qualities that the renderings had in them. 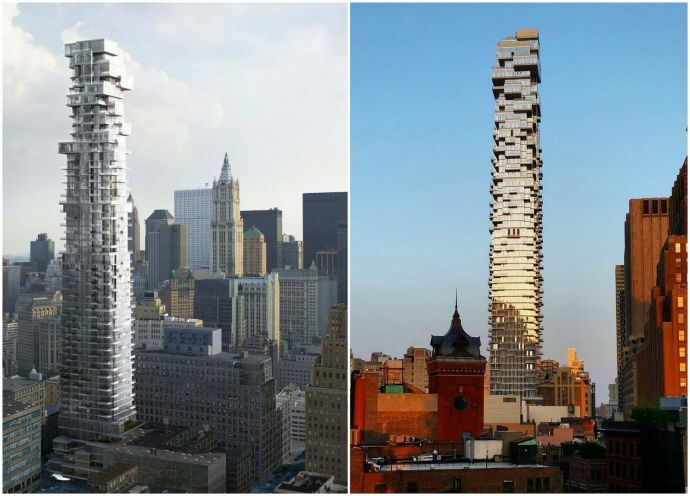 The sleek new luxury tower, built by Herzog & de Meuron (Swiss Architectural Firm) is located at 56 Leonard street in TriBeCa. This residential tower which is about 821 feet tall and 57 stories high is nearing completion. 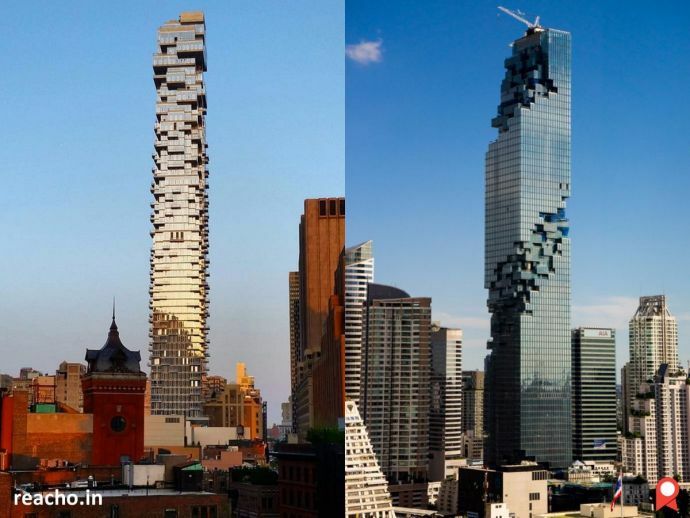 The tower is more apparent near the top, which has 10 penthouses stacked in an arrangement that allows for 200 feet wraparound views. The Jenga tower also provides amenities such as a 75-foot swimming pool and a fitness centre. Moreover, the residents will also enjoy living in the heart of one of Manhattan’s most desirable downtown neighborhoods. 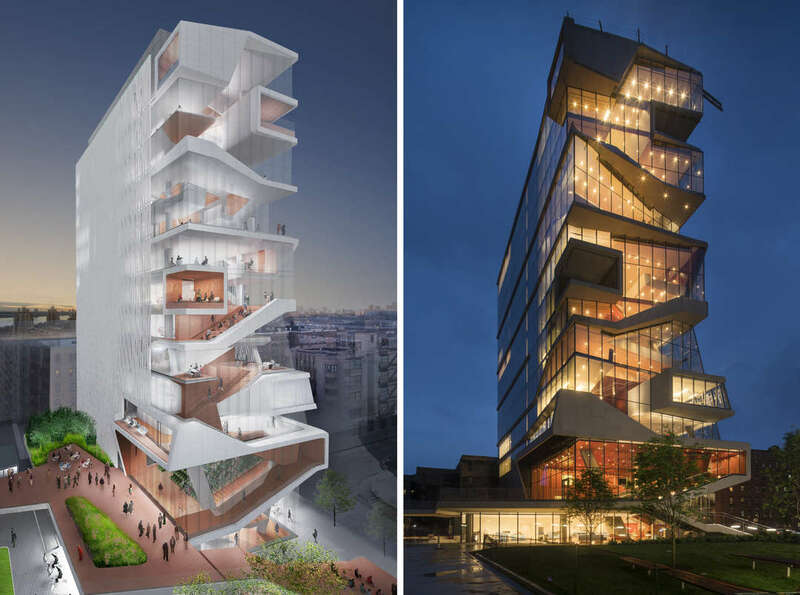 The Columbia University Medical Center’s new state-of-the-art medical and graduate education building is a 14 story glass and concrete tower located in Washington Heights in Northern Manhattan which is designed by Diller Scofidio + Renfro ( American Architectural firm). One of the most striking feature of this design is a vertical “cascade” of study spaces. It also features an impressive stepped study lounge, a student commons, group and private study areas and a café. Furthermore, there are a number of exterior terraces with stunning views towards the south, east and west. Moreover, the building has an advance clinical simulation centre, specialized rooms for mock examinations, a multi-purpose auditorium and a 275-seat hall used for campus-wide events such as lectures, screenings and concerts. This DS+R’s was the winner of the university’s paid design competition. 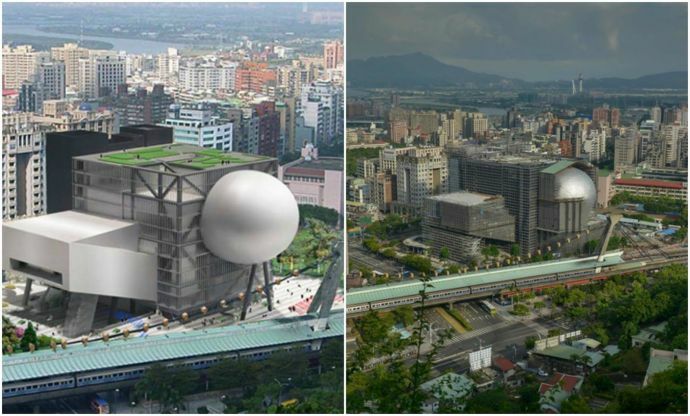 The ‘otherworldly’ arts center, situated in Taipei, Taiwan is designed by OMA (Office for Metropolitan Architecture), a Dutch architectural firm. This building has three theatres, which are the Proscenium Playhouse, the Grand Theater and finally the Multiform Theater. Each theatre has a meaningful part to play in the eye-catching resemblance of the center. The domed Louvre situated in Abu Dhabi, UAE, is designed by French architect Jean Nouvel. The dome which is 180 meters in diameter is referred as ‘the rain of light’. This is a reference to the emblematic Arabian architecture, such as the mosque. This 180-meter-wide structure allows natural light to permeate through the complex with waterways weaving between podiums and platforms. The tallest building in Thailand is located in Bangkok. Named the Mahanakhon, this unique tower is the brainchild of the German architect Ole Scheeren. 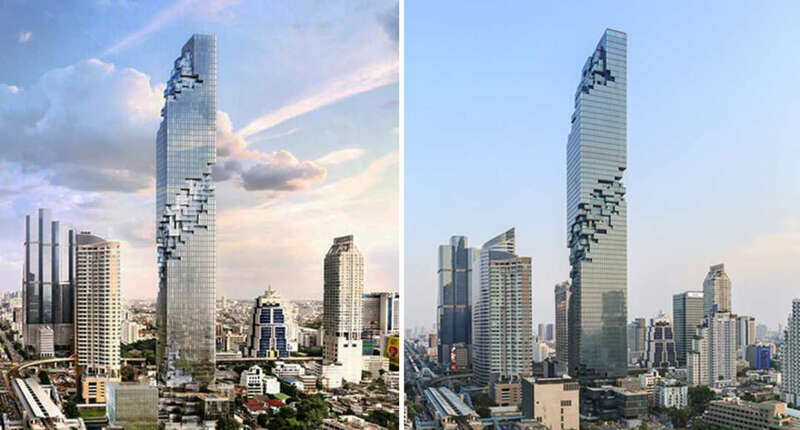 The Mahanakhon tower which is a remarkable 77-story, 1,030-feet (314-meter) structure, includes an adjacent, freestanding 7-story structure named “The Cube.” These two buildings frame a new outdoor plaza. While, most of the modern skyscrapers have a vertical orientation, this scheme has pixelated ribbons-which resembles flowing water, cascading from the top downward. The Crystalline Port situated in Antwerp, Belgium, is constructed by the British architect Zaha Hadid. This 12800 square meter development and 46-meter high extension, is Europe’s second largest port. The five-storey long extension consists of public counters, offices, an auditorium, meeting rooms and restaurants. 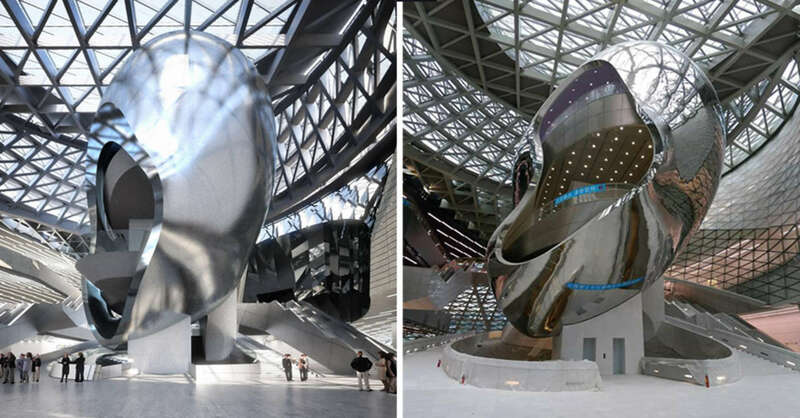 The new Museum of Contemporary Art & Planning Exhibition (MOCAPE) in Shenzhen, China, is designed and built by Austrian Architectural firm Coop Himmelb(l)au. The project combines two independent structures: The Museum of Contemporary Art (MOCA) and the Planning Exhibition (PE) as a cultural meeting point and a venue for exhibitions. The lobby, multifunctional exhibition halls, auditorium, conference rooms and service areas are used jointly. The ‘Plaza’ serves as a point of departure for tours of the museums. From the Plaza the rooms for cultural events, a multi-functional hall, several auditoriums, public functions like cafe and a library can be accessed. The national music centre located in Calgary, Alberta, Canada is designed and constructed by American design firm Allied Works Architecture. This national music center is called as the Studio Bell. The 160,000-square-foot project is formed by the connecting nine interlocking towers, featuring a suspended bridge. This new state-of-the-art cultural center is at once a performance hall, recording facility, broadcast studio, live music venue and museum-the first facility of its kind in North America and the first to be dedicated to music in Canada. 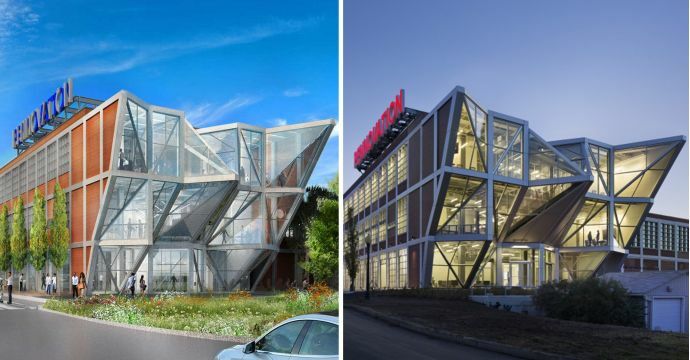 The Pennovation Center, located in Philadelphia, United States is built by American Architectural firm Hollwich Kushner. The Pennovation Center is a 58,000 sq. feet business incubator and laboratory that aligns and integrates researchers, innovators, and entrepreneurs for the commercialization of research discoveries. 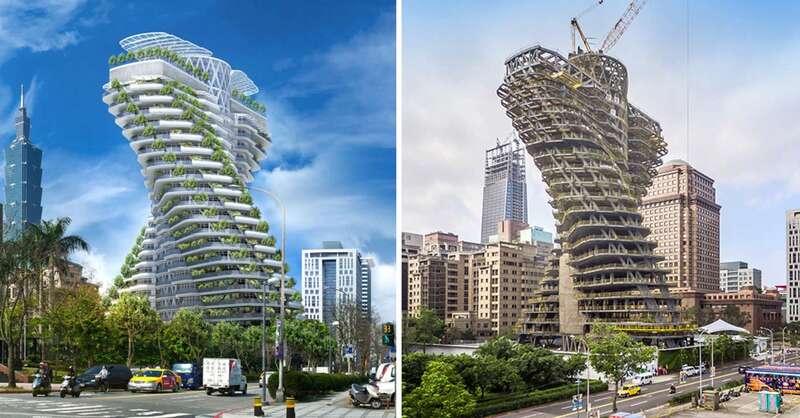 The Radical Forested Tower is designed and constructed by Belgian Architect Vincent Callebaut and is situated in Taipei, Taiwan. This building features a design that leaves ample space for planted vegetation. In total, it will house 23,000 trees, absorbing 130 tons of carbon dioxide each year. The building takes the form of a double helix, referencing its connection to natural forms. The 90-degree twist allows the building to take on multiple profiles. Furthermore, the building appears pyramidal when seen from north or south. The Labyrinthine Art Auditorium, located in Beijing, China is constructed by Austrian- Chinese firm Penda. This auditorium has the potential to host a variety of programs from lectures to exhibition and artwork trades. There is a lively box of arches, mirrors and steps which serves as the entryway to the auditorium. The entrance of the art auditorium is through a façade. From outside, the façade is mirrored in its centre offering identical doors through the solid exterior on the left and right side.